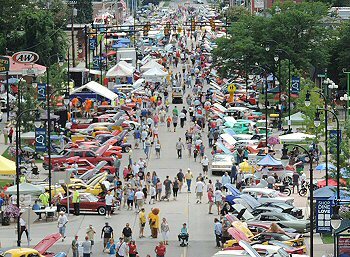 The ever popular Down On Main Car Show returns to Downtown Clawson – for its 17th year- on Saturday, August 11, 2018. This event presented by the Clawson Lions Club gets bigger and better every year. The car show entries – ranging from antiques to street rods, choppers, antique campers and bicycles – take over a half a mile of South Main Street starting at 14 Mile Road. Event registration for the show will be from 8:00 am to 11:00 am. Judging begins at 9 am. Event ends when the last trophy is presented. You must be present to receive your trophy. Spectators be advised; it is better to arrive after 10 am to avoid the display set-up and traffic. Having 400-500 event registrations is not unusual. CLOSED FOR VEHICLE DISPLAY BEFORE 8:00 AM. Please come “Down on Main Street” and support the charities, local business and community. Enjoy the day admiring the varied displays, the food, the music, 50/50 raffles, and tee shirts or if you’re a person who likes to mingle, this is the place to be! To download an event registration form and/or a sponsor form go to the Clawson Lion’s website at clawsonlions.org or closer to the event they will be available for pick up at Clawson City Hall, Hunter Community Center, Clawson Public Works Building or the United Street Machines web site. All proceeds will go to “Leader Dogs for the Blind” and other charities/projects supported by the Clawson Lion’s Club. For more information or answers to questions please e-mail the Clawson Lion’s at; info@clawsonlions.org or call Clive Brown (event co-chair) at 248-979-5250.